by James Slater – Though the late, great Charles “Sonny” Liston is arguably best remembered (certainly by younger fans) for his two fights with the one man he could never intimidate, in Cassius Clay/Muhammad Ali, it is beyond debate that the former heavyweight king was one of the most adept boxers in heavyweight history when it comes to frightening an opponent. Is Liston in fact, THE single most successful heavyweight in all of boxing when it comes to being able to win fights through little other than scaring his man stiff – therefore making his adversary an easy, ready-for-the-taking, deer caught in the headlights, “victim?” Of course, Liston had other ring skills, a punishing jab and awesome punching power, to name just two. But without his ability at terrifying an opponent even before the first bell, Sonny was certainly a lot less effective a fighter. This was also very much the case with another legendary heavyweight – the former champ who lists Liston as one of his ring idols. 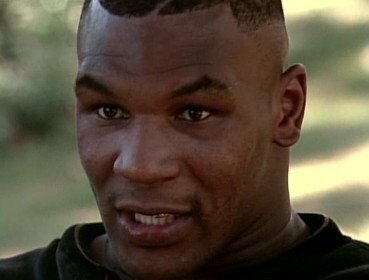 Mike Tyson’s name naturally springs to mind when thinking of heavyweight boxers who were able to win fights simply by reducing a challenger to relative helplessness through fear. And like Liston, when this particular weapon in the arsenal failed, Tyson’s effectiveness as a fighter was quite severely compromised. Take away either heavyweight champions’ intimidation tactics by refusing to fall to them, and you had a good shot at a win. Ali did it to Liston (and George Foreman, no slouch himself in the arms crossed, intimidate the hell out of you stakes!) While, most famously, James Douglas and later, Evander Holyfield, did it to Tyson. When this happened, and the fear was nowhere to be seen in the eyes their opponent, the tables were very much turned, and it was Liston and Tyson who became the ones being intimidated. Really, both greats relied so much on their menacing glares, their pre-fight promises of destroying a man and their mid-ring stare downs, that once they began to fail the number of losses began to mount. Liston was at his most intimidating going into his two fights with Floyd Patterson, who was scared stiff of him going into both bouts, while Tyson scared all but a few of his opponents before Douglas – most notoriously Michael Spinks, who looked like the very epitome of a fighter who had frozen. But who was the most effective intimidator – a peak Liston or a peak Tyson? Tyson admired Liston a great deal during his prime years. There is little doubt “Kid Dynamite” wanted to be like Sonny. Loving the way Liston petrified opponents, the young Tyson modelled (at least to some degree) himself on the champ from the early 1960’s. Pretty soon, with his aura growing and growing, the twenty-year-old was seen as being invincible – as was Liston back in his heyday. At their best, no other big men in boxing history were as proficient as Liston and Tyson as far as making a rival’s knees tremble as they awaited what was in store for them. And this is perhaps why the thought of a Tyson-Liston Dream Fight comes so readily to a fight fan’s furtive mind when, well, dreaming of a great fight that could never be. Imagine how fascinating a Liston-Tyson showdown would have been, from the intimidation factor alone! Who would have cracked and shown fear first; say with an aversive flick of the eyes when going face-to-face, or a slight quiver in the knees; anything the other guy might have noticed and picked up on. Imagine, two great fighters who were also bullies going up against veritable mirror images of one another. For my money, the older, wiser, mentally tougher and bitter Liston would have gotten to Tyson’s 20-something mind. Liston, by the time he had become champ (let’s say this particular Dream Fight pits the 1962 Liston Vs. the 1987 Tyson), had survived a violent upbringing, jail and the wrath of the prison guards and their batons, poverty and countless gym battles (both in and out of prison) and a broken jaw (Vs. Marty Marshall). Tyson by contrast, had had an easy time of it in his run up to the title. Whether Tyson could still have fought effectively after having been intimidated is a good question (for my money he wouldn’t have been able to have done so, and would have been crushed by an onrushing Liston, somewhere around the 4th-round) – but Liston was indeed THE most terrifying, most effectively intimidating heavyweight in history. Tyson, who would have been meeting his idol, would have blinked first in the run-up to this one. Next boxing news: Is Bob Arum cashing out on Kelly Pavlik? You are here: Home / Boxing History / Mike Tyson Vs. Sonny Liston!